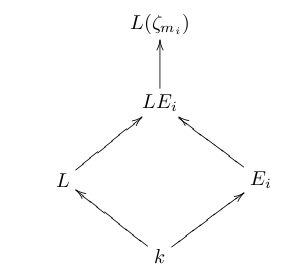 It is now time to prove the reciprocity law, the primary result in class field theory. I know I haven’t posted on this topic in a little while, so new readers (if they don’t already know this material) may want to review the strategy of the proof and the meaning of the Artin lemma (which is useful in reducing this to the cyclotomic case). The proof of this theorem is a little sly and devious. by the conjunction of the first and second inequalities, and the Artin map is surjective. If we prove that the kernel of the Artin map is contained in , then we’ll be done by the obvious count. This is what we shall do. where each splits completely in , and is cyclotomic, contained in for some suitable . We can choose the successively so that is not divisible by any of the primes dividing . Lemma 2 The field , the compositum of all the , satisfies . This is a fairly straightforward consequence of Galois theory. OK, cool. So we still need to do the reduction though. We can choose , an ideal of , such that for a generator. We can do this by the surjectivity of the Artin map, and moreover so that is prime to the primes above . Then satisfies too. This ideal is going to be a generic bookkeeping device with which we adjust to get something in . for very close to 1 at all the primes ramified in , and not divisible by those primes. But now is close to 1 at the primes of , i.e. in , if was chosen properly (i.e. REALLY close to 1 at those primes, which is kosher in view of the reciprocity law for cyclotomic extensions). Moreover is a norm from . The proof is now almost over. We have represented as a power of a fixed ideal times something in . In particular, we have is times some norm times something close to 1 at relevant primes. Taking the product, we see that is times some norm times something close to 1 at relevant primes. But now because this is equal to , so that sum is divisible by , and is a norm. We have proved that is in the subgroup, and this completes the proof. Again, it wouldn’t be appropriately dramatic if I didn’t state it in a box, right? The proof is now surprisingly easy. We can represent as a compositum of cyclic extensions over , by writing as an intersection of subgroups such that is cyclic and taking the fixed fields of . The compositum corresponds by Galois theory to the intersection of , and is cyclic. Now, there exist cycles such that each maps to 1 in by the reciprocity law (and existence of conductor) for cyclic extensions. Taking the product , we find a conductor such that the Artin map on acts trivially on each , hence on . and since, first of all, it is surjective; and second of all, the former group is of order at most that of the latter (by the second inequality), we have that the Artin map is an isomorphism. The proof of the reciprocity law, the prime result of class field theory, is now complete. Next time, we will take stock of how far we have come, discuss corollaries, and plan for the future.